In Time Management for System Administrators I describe a way to manage your todo lists which I call "The Cycle". The book came out before the existence of smart phones and app stores, so it doesn't include some important info. The iPhone app (now available for Android) that I use for The Cycle is Appigo Todo Cloud. It can be configured in a way that makes it easy to do The Cycle. If you recall, in The Cycle you set up a todo list for each day. At the end of the day, you move the remaining items to the next day's list. Todo Cloud doesn't support this directly, but you can fake it. First, we will use the "Due Date" field as the date you want to "do" the task. 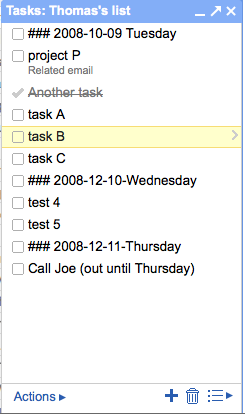 When we sort the todo-items by "Due Date" we'll see what appears to be one list per day. Second, to "bump" tasks to the next day, we'll configure the "Quick Menu" (press-and-hold on a task) to include the "Postpone" button. When you "invest 5 minutes" each morning to plan your day, simply press-and-hold any item you want to move to the next day (postpone). Drag and drop the items around to prioritize them. That should be all you need to do. However I set up my app a long time ago so I may have left some things out. If you set up Todo from a completely "factory default" state, I'd appreciate knowing if I missed anything. Note that I am not affiliated with Appigo. They probably don't even know that I recommend it so often or even know that their product works so well with the techniques recommended in Time Management for System Administrators. We are two people. The person that calmly makes plans and the person that executes them. The first person is calm and thoughtful and has the right amount of doubt to make sure a plan will work. The second person rushes to judgement and is full of hubris. "What was I thinking! I can do it more/better/differently." is what the second person says. The second person often forgets how much work went into the planning or the rationale for why things were set in a particular order. If an outside knows of the plan, it can confuse things if the second person "optimizes" the plan leaving those other people out of the loop. The second person often thinks they're the only one that knows the plan, but often they are forgetting someone. I've had to learn that if someone in my todo list is marked as being in a specific order, I should "trust the plan" and follow it... against the recommendation of that second person. A friend of mine recently said her plan in the morning involved seeing her son off on a trip then getting 4 things done at home. What happened was she made a last-minute decision to drive him to the event personally, which meant a series of problems including some delays that prevented those 4 things from getting done. Why didn't she listen to that person that, the night before, carefully constructed a good plan? I do a lot of volunteer work and often we spend a lot of time working on a plan and later when executing the plan people will start to make changes. This brings up all the "second person" problems but at an even bigger scale. You'll often hear me saying, "Trust the process" over and over. Once we were stuffing envelopes for a big mailing. It was a rather complicated project creating 3000 pieces to be mailed. Previously we had ended up in a situation where we ended up with 2000 properly stuffed, labeled, and stamped envelopes plus 1000 envelopes that just had stamps, and a different 1000 envelopes that were stuffed and had address labels stuck on them. We stuff the envelopes; only stuffed envelopes get labels, and only labeled envelopes get stamps. Three assembly lines, one that feeds the next. If you notice, the order also reflects the cost-of-replacement: stamps are expensive so you don't want to put them on until you know the envelope is otherwise prepared. When you run out of contents, no more stamps are consumed. Sometimes the labeling process was the bottleneck and someone outside the planning process would "help" by labeling empty envelopes. They don't realize the potential problem they are causing, or the confusion. Every morning I do my "5 minutes of planning". I look at my calendar then check my todo list for the day. I re-arrange my todo list, often pushing things around to be in priority order. I do this on the train so it is ready when I get to work. By the time I get working on stuff I've often forgotten the rationale for the order things are in, so I've had to train myself to "trust the process" and do the tasks in the order "the other me" proscribed. Because if I don't do that, I end up spending the morning writing a blog post instead of working on my todo list. And that can disorient my entire day. As I mentioned previously, I'll be presenting two tutorials at LISA 2009. Both are new. The one on Time Management is a total re-write. That's why it is subtitled "a new approach". I've been teaching time management to system administrators for long enough that I've discovered that what people really need is a new way to think about their entire day. By thinking about their day ahead of schedule we can make adjustments to how we operate that day. The result is more satisfaction at the end of the day. People that have taken my class before should find it interesting and new; plus a good refresher on things they may have forgotten, or wasn't relevant until the more basic stuff had "sunk in". I'm taking a break from working on my slides to post this. I should get back to work! Hey time management fans! Google has announced a very simple task manager to gmail as part of their "labs" offering. What's my favorite feature? The fact that there is now a menu item under "More Actions" that lets you turn an email into a task. The subject line is used for the task, and a link to the original message is included. I think this makes it very powerful. In summary: The fact that the tasks aren't a function of the calendar like most systems is interesting, and will require some adjustment. The ability to easily link tasks to email threads has some interesting possibilities. A time management problem that people often ask me about is how to get started on a new big tasks (NBT). With a heavy number of interruptions, meetings, and so on it can be easy to get distracted and never actually start that important NBT. Starting a NBT is also a bit intimidating; it's emotionally easier to continue with checking email, answering tickets, and (this is the big one) work on less important, but easier, tasks. When I need to start a new big task I hide. I really do. I find a small conference room, hide, and work for an hour disconnected from the internet. I'm not ashamed to admit this. Hiding really works. I'm not completely hidden. I don't cover the windows. People can find me. My immediate coworkers know where I am.